OpIndia.com believes that this cartoon captures the essence of the attitude so-called secular-liberal Hindus have towards the religious-cultural Hindu. 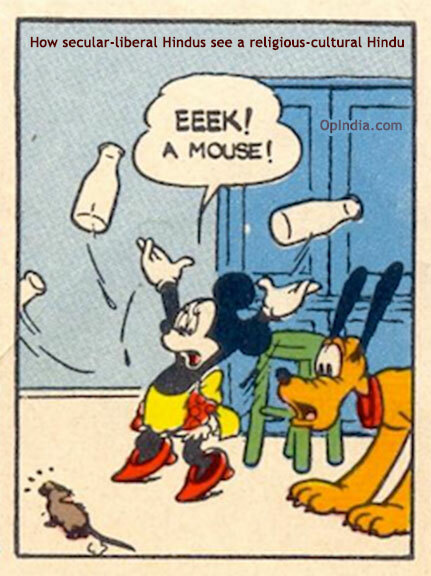 In the cartoon, Minnie mouse feels she is superior to a common mouse and feels almost shocked and disgusted after seeing a common mouse. Similarly, despite being born a Hindu and possessing the secular-liberal thanks to the culture they grew up in, such secular-liberal Hindus don’t feel like Hindus and feel superior to a common Hindu. And their attitude is as funny and ironic as the attitude of Minnie mouse in the above cartoon.